1. Can you give readers a hint of what to expect on Outlander, Season 4? Without giving away too many spoilers, Jamie and Claire have washed up on the shores of America and it’s a new world. … It’s a wonderful experience for Jamie to find somewhere he wants to live and lay down roots. And we see them for the first time build a home and build the family structure they wanted. Until, of course, things get up in the air again. 2. 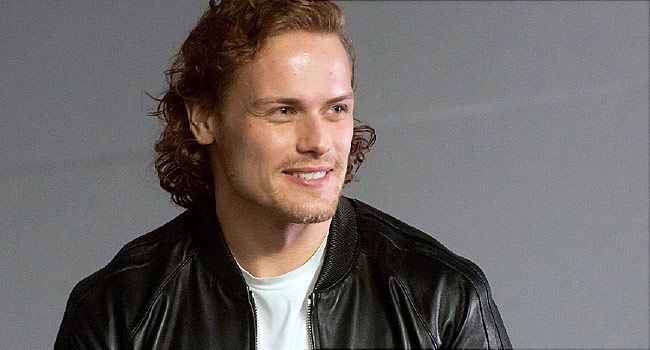 What have you enjoyed most about playing Jamie Fraser? When you’ve been living with a character for so long, you really get the opportunity to feel comfortable in his skin. And you really begin to know the character. So when you come into each scenario, you have a very strong idea of how this character is going to react. 3. This summer you star with Kate McKinnon and Mila Kunis in The Spy Who Dumped Me. How would you characterize the movie? It’s an action-comedy. The writing is very funny, and we’ve got a terrific duo with Mila and Kate. They are the only people you want to go on a road trip with around Europe while being chased by bad guys. 4. What is My Peak Challenge? My Peak Challenge is the charity fundraiser I started on social media. Over the last 3 years, we’ve expanded it into a community-based online workout and nutrition program. You can sign up, and each day you get a workout video that’s totally scalable to your needs. 5. How does My Peak Challenge help the blood cancer charity Bloodwise? Fifty percent of our profit goes to charity. For the past 3 years, Bloodwise has been our chosen charity. They are a fantastic charity that does a lot of leukemia and lymphoma research. And we’ve been really fortunate that we’ve raised over $1 million for them. This year we’ve decided to support another charity, Marie Curie, which supports people with terminal illnesses in hospice or going through treatment. 6. What does your typical workout look like? I do gym-based conditioning. I love to get outdoors a lot. I’m currently training for two marathons. I do some martial arts, which was really helpful for the movie -- for the fight sequences. Boxing, as well. I mix it up as much as possible. 7. When it comes to your diet, do you have any bad habits? I’m a Scotsman, and I do enjoy a whiskey now and then. That would probably be my first protocol on a rainy Sunday in Scotland. I love to eat all kinds of food. And that’s the great joy about My Peak Challenge’s nutrition plan. It really doesn’t say anything is off-limits. It’s about balancing that with something healthy. I’m more than happy to consume a whisky, and maybe a slice of pizza or haggis. 8. What is your personal health philosophy? It’s about challenging myself and reaching new horizons. I like to mix things up and not get too comfortable. So I guess my philosophy would be, challenge yourself and nothing is unattainable. 9. If you traveled back to the 18th century, what would you miss most about the present day? Honestly, I don’t think I would last that long. I probably would be dead in a couple of weeks. Those were really tough times, and people were very hardy then. I’d miss central heating. I’d miss electricity, hot water, a soft bed -- all the nice luxuries. 10. What is your best piece of health advice? Sleeping and rest would be the best advice. Make sure you get 7 to 8 hours a day.